Every year, there's a temporal waterfall seemingly flowing with lava down the East side of El Capitan, the massive granite formation in Yosemite Park, California. Only people at the right place and time are able to see it. 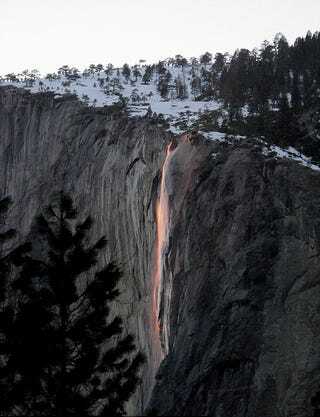 It's called the Horsetail Fall. And, of course, there's no magma involved. It's an optical effect produced by Earth's angle in relation to the Sun and the geographical position of the waterfall itself. The Horsetail is a seasonal waterfall that only happens in the winter and early spring. At sunset, during a few days in February, the water seems to turn into a cascade of lava under the rays of our home star. The color varies in intensity depending on time and weather conditions.